A new safety, ergonomic and anti-fatigue mat that is twice as thick as typical counterparts has been released by the General Mat Company. Ultra-Soft Diamond Plate No 414 is intended for ultimate comfort in all dry work areas. The 80mm (five-sixteenths of an inch) thick general purpose mat comes with bevelled edges for safety and a very high, non-slip friction coefficient of .68 Dry per American Standard ASTM F1677. Featuring GMC’s best-selling diamond plate tough vinyl surface on its double-thick Nitricel® sponge base, Ultra-Soft Diamond Plate No 414 is particularly suitable for manufacturing industries with an ageing workforce, says GMC Managing Director Mr Michael Siegle. “As the ageing Baby Boom generation passes through Australia’s industry there is an increasing risk of slip, fall and strain injuries that this product addresses,” he says. “In addition to offering safety on steroids comfort levels, this mat is very durable with a high Tabor abrasion performance of one per cent losses at 1000 cycles." (Per Federal Standard 193 – Tabor tests determine how well a mat will hold up to heavy use. The less weight a sample loses, the more durable the product tends to be). 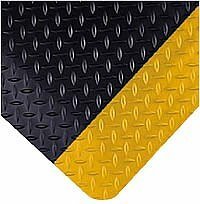 Manufactured by one of the world’s leading safety and anti-fatigue mat specialists, The Tennessee Mat Company, Ultra-Soft Diamond plate No 414 is available in black and black with yellow chevron edging in a range of stock sizes as well as being cut to custom lengths.